Walking with Jesus: Day 61: Acts 17:22-33 & Proverbs 21:17-24 - How Do We Connect Unbelievers to God? Day 61: Acts 17:22-33 & Proverbs 21:17-24 - How Do We Connect Unbelievers to God? How Do We Connect Unbelievers to God? We live in a pluralistic culture full of unbelievers. In so many ways, our culture is just like ancient Athens. Although our culture claims to be much more secular and has a larger number of anti-religious people, still various forms of unbelief marked by idolatry are rampant all around us. As believers who love the Lord and are called to love our neighbors, we struggle to know how to reach our unbelieving neighbors and how to connect them to God. Today's text gives us a wonderful example of how to do this. 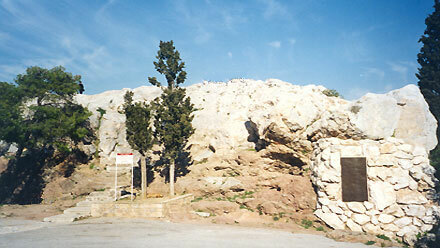 The Aereopagus today, with a plaque containing Paul's sermon from Acts 17. In our last reading, we saw Paul's grief over the idolatry of Athens. We saw his drive to engage people with the Gospel. Today, we see him addressing a prestigious gathering of intellectuals on the Aereopagus, the rock outcropping on Mars Hill. This site had been the gathering site of the Athenian Senate for hundreds of years and was a place of public discourse and deliberation. Paul begins his address on Mars Hill in an unexpected manner. The idolatry that has grieved him so much was, in fact, a symptom of the desire of the Athenians to worship. The Athenians were deeply religious and passionately committed to seeking the truth - or at least, that's what they told themselves! So Paul connects with this in a positive way. He commends them for their religiousness, even though it was sinful and idolatrous. Next, Paul surprises again by saying that he had come to proclaim to them "the unknown God" they worshiped. So, Paul is really seeking to connect to what they already have in their cultural life. He goes even further by quoting from their literature: “‘In him we live and move and have our being" and “‘For we are indeed his offspring.’" These are not quotes from Scripture but from pagan Greek poets, probably writing about Zeus. 1. Get to know our neighbors and their culture well enough that we can "speak their language," incorporating cultural references that they would understand. 2. Affirm what is positive in their culture that might connect with a God-ward orientation. 3. Affirm and celebrate the equality and even the unity of all humanity under God, as His offspring. 4. Tell the truth, clearly and boldly, about who Jesus is, what He has done and what He will do when He comes again. Heavenly Father, we know that our neighbors need You. They need to be reconciled to You, which is only possible through Your Son, Jesus Christ. Thank You that You have provided salvation through Your Son, Give us the wisdom, understanding, courage and faith to be good witnesses to our neighbors of the truth that is in Jesus. In His name we pray, Amen. Heavenly Father, we love You and we love Your righteousness, Your truth and Your wisdom. We confess our own folly and our own tendency to be arrogant and to scoff, to be wasteful and to love pleasure more than wisdom. We confess that we have not always kept our mouth and our tongue, but we have often been quarrelsome and fretful, arguing and worrying instead of loving others and trusting You. Have mercy on us. Cleanse our hearts of these things. Fill our minds with Your truth, our hearts with Your love, our lips with Your words and our lives with Your righteousness. In Jesus' name, Amen.